The Americana at Brand proudly offers an array of five-star services to ensure every visit is an enjoyable one. If you would like personal assistance with accommodations for large groups, planning special events or maximizing your visit in any way, please visit or call Caruso Concierge for personal assistance. Located in The Grand Lobby, The Americana at Brand’s award-winning Concierge is available to assist with any task. This complimentary resource offers guests the ultimate in convenience, from gifting and shopping assistance, to travel and meal reservations and even one-of-a-kind celebrations. You’ve found the perfect present, now wrap it with love with our premium Gift Boxes, available at Caruso Concierge in two ready-to-gift sizes. Each comes with a card & envelope, tissue paper, and your choice of a red or silver ribbon. Our bellmen are happy to help take the weight off through hands-free shopping. Visit Caruso Concierge or call or text 818.637.8982​ so we can retrieve your shopping bags and either place them in your vehicle or securely store them. Our Concierge can secure dining reservations at The Americana at Brand or elsewhere in the city, as well as arrange transportation and even your next vacation. For assistance, visit the Caruso Concierge desk or call or text 818.637.8982. Our Concierge has access to many of the most popular concert and event venues in Southern California, and will do its best to help you reserve tickets to upcoming shows. For arrangements, visit the Caruso Concierge desk or call or text 818.637.8982. Concierge is available to arrange various shipping and courier services. Please visit Caruso Concierge in the Grand Lobby for assistance. Whether you’re looking for the perfect birthday present or creating a bridal or baby registry, Caruso Concierge will gladly coordinate shopping assistance for our guests year-round. From apparel, shoes and handbags, to home goods and beauty products, Caruso Concierge will work with our wide network of retailers to expertly curate styling options for film, television and print. We also will arrange convenient on-property pickup of the merchandise. From birthdays and date nights, to marriage proposals and parkside picnics, our team will help you sort out all the details to create an unforgettable moment. Caruso Concierge provides complimentary stroller, wheelchair, umbrella and cell phone charger rentals. The Union Bank® ATM is located near The Grand Lobby, near Caruso Concierge. Union Bank® offers a full spectrum of financial products and services to consumers, small and large business, public entities and non-profits through a network of over 340 consumer banking branches in California, Oregon, and Washington. Additionally, through The Private Bank, it offers a variety of comprehensive and customizable wealth management services. 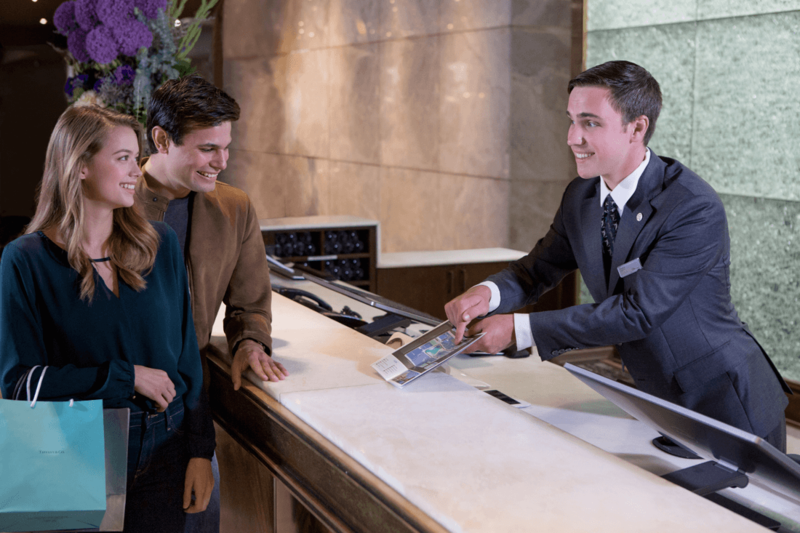 In addition to ensuring your visit to The Americana at Brand is as enjoyable as possible, we look forward to helping enhance your overall stay in Los Angeles. Let our team of knowledgeable and friendly experts book you a hotel, make dinner reservations, recommend nearby attractions, and more. For guests requiring foreign language assistance, our multilingual team members provide translation services in Spanish, Mandarin and more (depending upon availability). Notary services are available, by appointment, through Concierge. Please visit the Caruso Concierge desk or call or text 818.637.8982 to make an appointment. We are a pet-friendly destination and welcome all your canine friends. Gift cards are available in amounts ranging from $25 to $1,000. They can be purchased at Caruso Concierge in the Grand Lobby. 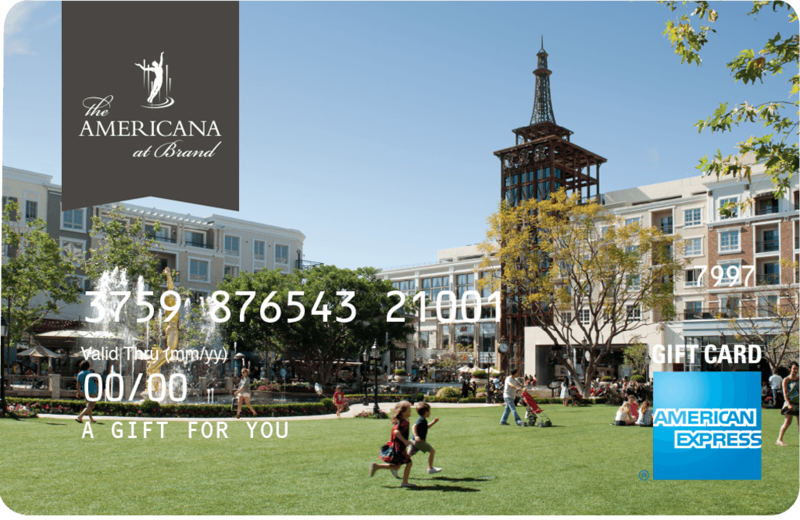 The Americana at Brand American Express(R) Gift Card is redeemable nationwide, virtually everywhere American Express(R) Cards are accepted. Our Gift Cards make a perfect gift for corporate incentive programs and special holidays. Lost ticket pays daily maximum. Services may be limited in the event of inclement weather. We invite parents, caregivers and children to visit The Americana at Brand’s Family Lounge, located in the Grand Lobby. There you will find changing stations, nursing rooms, a play area for kids, and more. 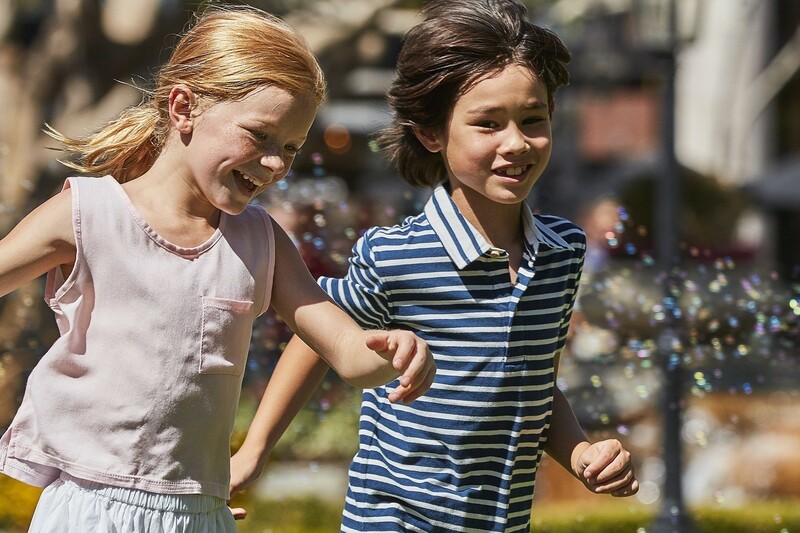 Join Us for Kids Club, Every Tuesday, from 11 am– 1 pm, on The Green. Kids, parents and caregivers are invited to experience a weekly dose of fun, including live music and more!